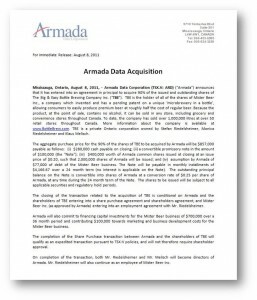 Mississauga, Ontario, August 8, 2011, – Armada Data Corporation (TSX.V: ARD) (“Armada”) announces that it has entered into an agreement in principal to acquire 90% of the issued and outstanding shares of The Big & Easy Bottle Brewing Company Inc. (“TBE”). 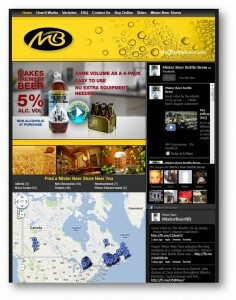 TBE is the holder of all of the shares of Mister Beer Inc., a company which invented and has a pending patent on a unique ‘microbrewery in a bottle’, allowing consumers to easily produce premium beer at roughly half the cost of regular beer. Because the product, at the point of sale, contains no alcohol, it can be sold in any store, including grocery and convenience stores throughout Canada. To date, the company has sold over 1,000,000 litres at over 50 retail stores throughout Canada. More information about the company is available at www.BottleBrew.com.